Last night the Dow Jones managed to close in the black for the eighth trading day on the trot. Reading this statistic, we might expect the week to be better than it actually has been. Most world stock markets are up on the week, but the gains have been negligible by recent standards. Nevertheless, the bulls have shown impressive resilience with the bears unable to drive markets down with any great strength. This morning the FTSE, DAX and CAC are taking their lead from the US and have opened up around 0.7% to 1% higher. This morning we saw the UK GDP figures at 08.30 GMT which came in marginally better than expected. This sees the US personal spending data and consumer sentiment figures, but these are expected to have only a medium impact on markets. The Yen is in play again, this time on the defensive though. Buoyed by the ability of equity markets to hold their ground, the risk takers are dropping the yen in favour of the euro, dollar and pound. Of the commodity currencies, the Canadian dollar has been rangebound this week especially against the US dollar. 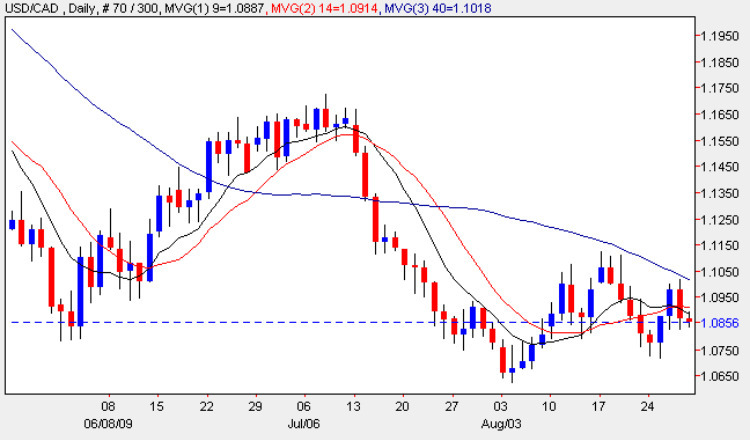 If oil prices continue to stabilise, the USD/ CAD could continue its previous down trend and hit 1.08. A No Touch trade could be the best way to play this over three days.